The Bournemouth Symphony Orchestra Experience! We’re really pleased that on 12th February professionals from the Bournemouth Symphony Orchestra (BSO) are coming to lead one of our rehearsals. This time the conductor will be Marta Gardolińska. 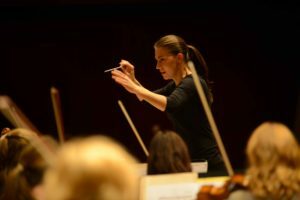 The award-winning polish conductor, Marta Gardolińska has been establishing her name in the classical music scene in her country and abroad as an inspiring and versatile conductor. Marta has joined the BSO as the Leverhulme Young Conductor in Association in September 2018 after a rigorous audition process. Marta will be joined by a selection of BSO players who will sit in with our players and support / guide / encourage as required! This is the second time that the BSO & COCO have collaborated in this way. Players still talk about the previous event in 2017 and how we gained so much from it.